Dear Friends and Followers: Big Dope is being a jerk again. I reported him to the ASPCA, thinking it was an organization to prevent cruelty to aliens. Turns out, it has to do with dogs and cats. Why do they need protection? They are the most pampered and protected species on your planet. Fascinating. Anyway, he caught me watching “The History Channel” on TV. Said if I wanted to know anything about your country’s history, I needed to quit watching shows about pawn shops and read. So I did as he ordered and it required me to think, and that makes me tired and irritable. But, I did run across an interesting quote from one of your country’s so-called “Founding Male persons whose sperm unites with an egg, resulting in the conception of a child.” (Editor’s note: he means Founding Father—translator problems again). The quote goes like this: "What is government itself but the greatest of all reflections on human nature? If men were angels, no government would be necessary." One must assume he intended to include women in the observation, but one never knows about that bunch and who they intended to include when they founded your country. Anyway, that seems to make sense to me. All men are certainly not angels. Take Big Dope for example. Case closed. 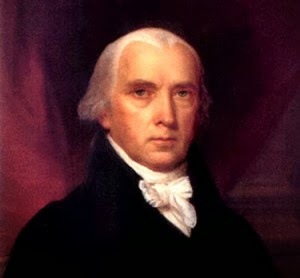 But what is puzzling to an Alien is this: here we have an architect of your constitution, none other than the future President James Madison expressing the need for an organized and regulated society. Then we have all these folks you have elected to public office lately who believe just the opposite, like the guy from Kentucky with the weird hairpiece. Their belief seems to be that we should eliminate all government and then things will work out fine. My counterpoint who was sent to a country called Somalia tells me this isn’t true. These fellows were no angels. things than this current bunch. - C.W. And anyway, would angels need no supervision? Can you see the confusion in the morning when they line up to get their harps if a senior angel isn’t there to keep order? Who would lead the Heavenly Choir? Can you imagine them flying around in all directions with their wings flapping with no regulation of the cloud-ways? Fascinating. Anyway, I’m tired of thinking for today. Believe I’ll watch TV. I’m back. I wanted to see if your senate was going to vote to invade Iran. Big Dope wants a report. Nothing in the news, though, but some guy with a strange beard who thinks that black people would be happier if you re-enslaved them. You have a strange country.